Topic: Uncanny X-Men spoilers leaked...? 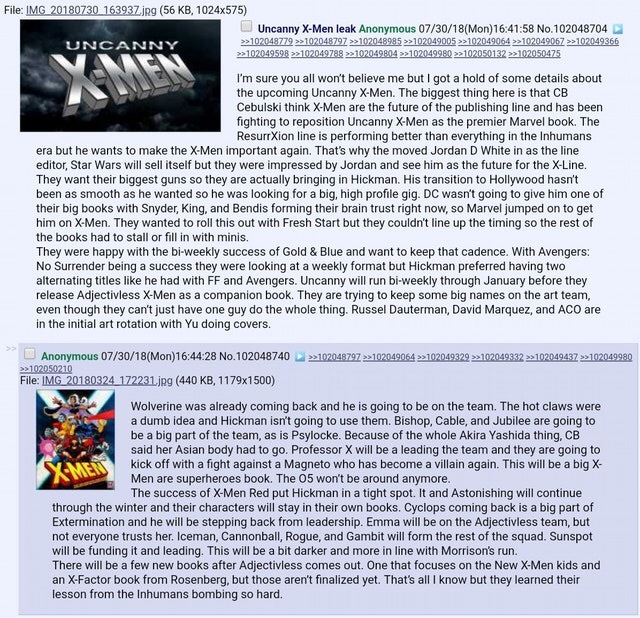 If true, Gambit ends up on a team of Iceman, Rogue, Cannonball, Emma Frost, Cyclops being lead by Sunspot. They’ll end up on the adjectiveless title launching in January. It’s be ~darker~ (ugh). Written by Hickman. Re: Uncanny X-Men spoilers leaked...? Sounds alright, but the last big leak like this was pretty all made up. A little hard to believe. I wouldn't mind, though. Love to see Gambit in another team book. Dang, I'm trying not to get my hopes up but that sounds amazing. I know a lot of people are already speculating Cyclops's return bc of that Extermination cover Mark Brooks did as well as Hickman being on Uncanny, so it could definitely just be someone feeding into that. Very much doubt this is true. Last i remember Hickman dislikes Gambit.